Every family has their favorite version of mac and cheese — whether it comes from a blue box or the stove top. No matter your age, this popular dish evokes childhood nostalgia. It's still my ultimate comfort food. Here's one of my favorite recipes for it. Start by boiling the pasta in salted water until just past al dente. Drain and set aside. In a medium saucepan, melt the butter over medium-low heat. Add the onion and season well with salt and pepper, as well as the red-pepper flakes and mustard powder. When the onion is tender, add the minced garlic and cook for one more minute. Add the flour and stir vigorously for one to two minutes, until the mixture has formed something of a paste. Pour in 3/4 cup milk and stir continuously, increasing the heat to medium-high. The mixture will become a thick, white sauce. When it starts to bubble, reduce to medium heat and add the shredded cheese, stirring it in as it melts. You may want to add the extra 1/4 cup of milk to reach your desired cheese-sauce consistency. When the sauce is smooth, remove it from the heat. Toss the pasta in the cheese sauce, then transfer it to a baking dish. 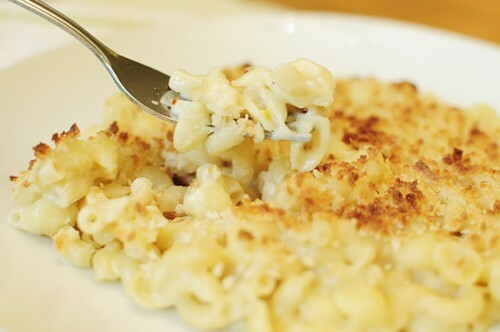 Cover the pasta with a thin coat of Panko breadcrumbs, then bake in the oven 10-15 minutes, until the cheese sauce is bubbling and the breadcrumbs have turned golden brown.